Women are the ones more willing to do the searching than men. *See “Key Findings” below for details. Online Dating Expert and Spokeo spokesperson, Julie Spira, confirms the importance of research while dating, especially during the extra-stressful holiday season. Following Spokeo’s first People Search Survey, titled “Search Before you Date,” this second iteration of dating research focused on dating, research and safety. 71% of Americans are willing to do their research to feel safer about someone they are in a relationship with, or considering a relationship with. The numbers are pretty similar for those willing to pay for research (35%) and those who only use the tools that are available for free (36%). When broken down by gender, women are generally more willing to conduct a search at all (77% of women vs. 66% of men), but are less willing to pay for a search (40% of women would conduct only free searches vs. only 32% of men). Who’s doing the spending? 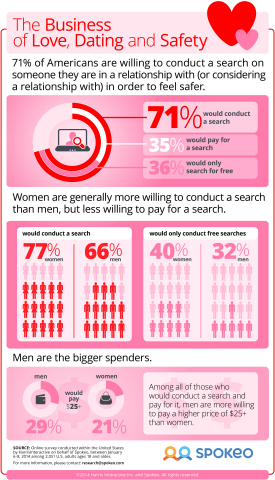 Of those who would conduct a search, 29% of males are willing to pay a higher price of $26+ vs. only 21% of the women who would pay the same higher amount. To learn more about dating and safety research, view the full report at http://www.spokeo.com/dating-safety and tweet your thoughts to @Spokeo and @JulieSpira using the hashtag #datingresearch. This survey was conducted online within the United States by Harris Interactive on behalf of Spokeo from January 6-8, 2014 among 2,051 adults ages 18 and older. This online survey is not based on a probability sample and therefore no estimate of theoretical sampling error can be calculated. For complete survey methodology, including weighting variables, please contact research@spokeo.com. Spokeo is a leading people search service using proprietary technology to organize public information into comprehensive yet easy-to-understand online profiles. Based in Pasadena, Spokeo makes it easier than ever to help reunite friends and family, browse celebrities, and discover information about your online footprint, by simply searching a name, address, email, phone or username. For more information about Spokeo, visit www.spokeo.com or follow @spokeo on Twitter. Julie Spira is a top online dating expert, bestselling author and founder of CyberDatingExpert.com. Spira was an early adopter of the Internet and online dating and has been helping singles find love online for 20 years. She ranks as one of the most influential people in the subjects of dating and online dating on Klout and is a frequent guest in the media with her online dating and safety advice. Follow @JulieSpira on Twitter. A January survey, released by Spokeo, reveals important data about dating, safety and the research habits of Americans as we approach Valentine's Day.